Fresh chile peppers are a common ingredient in Mexican food. Jalapenos are a ubiquitous ingredient in pico de gallo, chile rellenos (which means stuffed chiles), and the hearty stew chile verde, which gets its spice from green chiles. Their popularity in Mexican cuisine may be due to the fact that green chile peppers grow well in hot climates. Although they can be harvested throughout the summer, these peppers reach their peak in late summer and are best when harvested then. Green chiles come in thousands of varieties, and some peppers even go by different names. This can be very confusing if you're looking for a specific type of pepper, but once you get a handle on the more popular fresh chiles and some of the names they go by, you will have no trouble finding the right chile for your recipe. For different degrees of spiciness among the different types of peppers, consult the Scoville Heat Scale. This pepper is known in Mexico as chile verde del norte, since it is common in the northern part of that country and virtually unknown in the central and southern regions. It is also one of the most common chiles in the southwestern United States. These long, bright green chiles were taken from New Mexico to California in the early 1900s and were bred to be milder in order to suit the taste of the norteamericanos of that time. They became popular in Anaheim, a city in California, and the peppers go by either name—the city or the state. This is one of the few chiles that retains its name when ripened and dried. Therefore, if a recipe calls for Anaheim or California peppers, you should make sure you're getting the right ones for the recipe, meaning fresh and green or red and dried. Keep in mind that while these green chiles are some of the mildest around, they can still vary in their heat level. Next time you get your hands on some Anaheim chilies try a slow-cooked chili verde with pork. These long green chiles are virtually identical to California and Anaheim peppers, with one distinct difference: they are much, much hotter. Hatch chiles are New Mexico chiles that are grown in the small town of Hatch, New Mexico, and are considered premium green chiles. Each year they hold a Hatch Valley Chile Festival on Labor Day weekend where up to 30,000 people come to the little town to buy and eat these delicious peppers. These chilies are called chile verde del norte in Mexican territory, where they are known only in the northern areas. Hatch and New Mexico chiles can be used for the same dishes as California and Anaheim chiles, but keep in mind that they hold a lot more heat. If you like spicy, a pollo verde with Hatch chilies might become a favorite dish. Named after Puebla, Mexico, this type of pepper has a beautiful dark green color and is wider than the Anaheim chile. It is usually hotter than the Anaheim as well, though its piquancy varies and it can sometimes be very mild. Poblanos are widely used in a variety of ways all over Mexico and are the most common peppers employed in the preparation of chiles rellenos and chiles en nogada. When dried, the poblano is called an ancho chile. 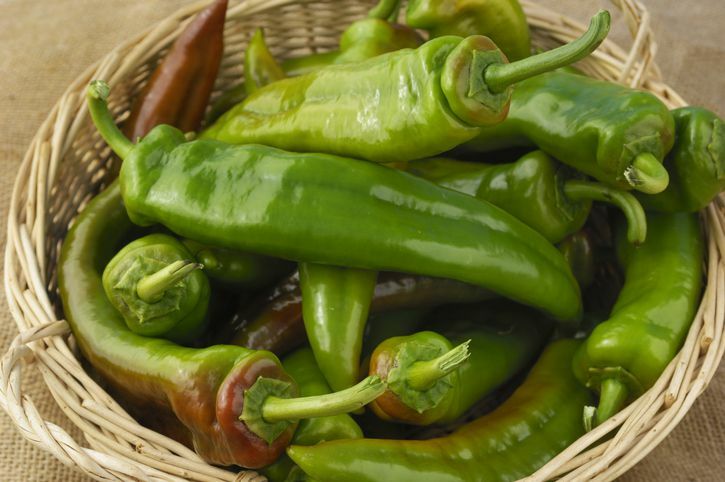 It is important to note that in the United States, some vendors will incorrectly refer to the poblano as a “pasilla” pepper, while others misspell this variety as "pablano." The chilaca green chile is long and narrow like the New Mexico pepper, but its color ranges from a rich green (similar to the poblano) to a dark, chocolatey brown. It is used in a variety of Mexican dishes but is most often employed in its dried form, when it takes the name pasilla chile. Use the dried version in a recipe calling for dried red chilies, such as ​chili colorado, a Mexican beef stew. Well-known in and outside of Mexico, jalapeno (pronounced hah-lah-PEN-yoe) peppers are perhaps the most famous fresh chiles of all. They take their name from Xalapa, also spelled Jalapa, in the state of Veracruz. Jalapeños can be stuffed and served as an appetizer (as in jalapeño poppers), but they are most often used as a condiment, either whole or chopped, fresh or pickled. When dried and smoked, jalalpeño peppers take on a very different flavor and are called chipotle chiles. Smaller and narrower than jalapeños, serrano peppers tend to be very hot. They are usually used in salsas and as a flavoring, not as the main component of a dish. They can be roasted, but they can also be chopped up in their fresh state (keeping or discarding the seeds) and used as a topping or seasoning to add heat and flavor to a dish. The dried version, called simply dried serrano or serrano seco, is relatively uncommon. Kick-start your day with machaca con huevo, a Mexican beef and egg dish flavored with the spicy chili. The habanero chile, pronounced ah-bah-NEH- roh, is one of the hottest peppers grown. It is roundish or bell-shaped and can be green, yellow, orange, red, or even purple or brownish. Common in the regional cuisines of the Yucatan Peninsula, habaneros are most frequently used to flavor sauces and salsas, like an apricot-habanero barbecue sauce.